TDI is the short form for toluene Di isocynate. Loading, carrying and discharging this cargo is not a child’s play. And there is a reason that I say this. TDI reacts with moisture and water. 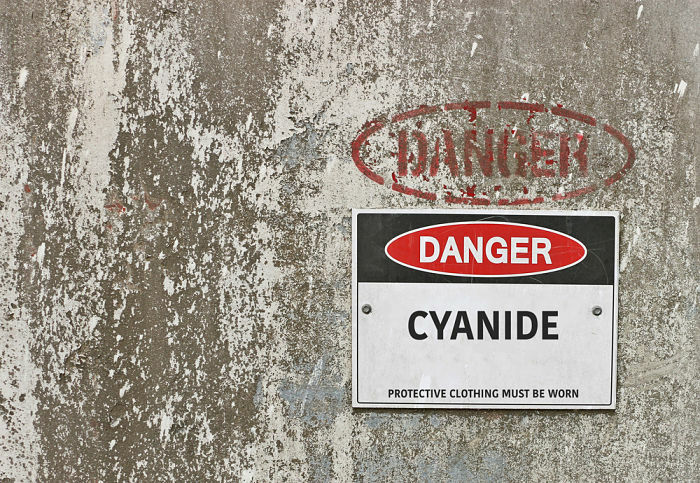 It comes under cynide group of cargoes and is highly toxic. It can ingest through skin. And not the physical contact but even its vapors can ingest through the skin. And after all these, TDI may require heating as its melting point is high. So many dangerous elements in one cargo and that’s why it is important to handle it carefully. But in spite of being so dangerous there are hardly any cargo specific guidelines for carrying this cargo on ships. There are some extensive guidelines for handling TDI ashore but not for carrying on board ships. So I am hoping this guide can fill that gap. Lets begin our voyage to carry TDI on board a chemical tanker. Lets embark on a journey from loading and discharging a cargo of TDI. On receiving voyage orders to carry TDI onboard, first thing to check is if we can carry this. By that I mean if the ship is designed to carry this cargo. This is not only with TDI but every cargo loaded on chemical tanker need to be checked if we can carry that. To check this, take out the cargo list attached to the “certificate of fitness” of the ship. Certificate of fitness (COF) lists all the cargoes the vessel can carry. The name of the cargoes mentioned are the IMO names and are listed alphbatically. 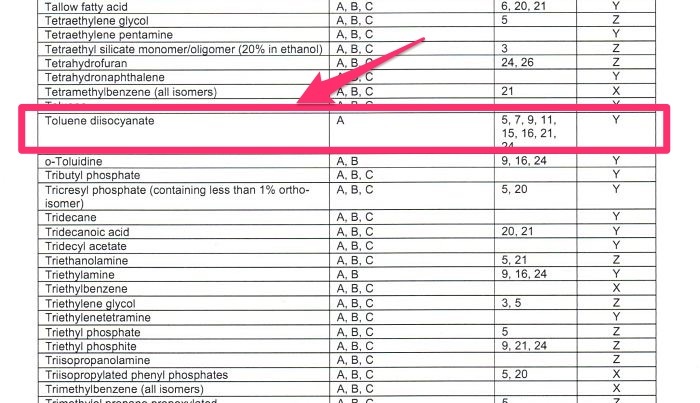 Below is the section of actual COF cargo list of a chemical tanker. As we can see Toluene Diisocynite is there in the list. So this chemical tanker can load TDI. As we can see that on this ship, TDI can only be loaded in group A tanks and has some pre-conditions for loading TDI. While deciding if we can load TDI, we must satisfy these conditions. There are few things which chief officer need to keep in mind before he plans stowage for TDI cargo. As TDI reacts with water, there cannot be any ballast adjacent to cargo tanks containing TDI. We need to check all stages of loading and unloading of each grade. We need to be sure that at no stage trim and list are so uncontrollable that we need to take ballast near to TDI tanks. We already discussed this. And we saw that as per COF, we can load TDI only in group A tanks. But even in group A, we should try to stow TDI as forward as possible. This is to avoid any exposure of TDI vapors inside the accommodation. Usually we should try to stow TDI in tanks which are midship or forward of the midship. This is obvious but is worth mentioning. TDI comes under USCG compatibility group 12 and as such is not compatible with many cargoes. Stowage plan must ensure that we do not stow any of these uncompatible cargoes adjacent to TDI. Again as the TDI reacts with water, we cannot heat it with steam. Instead thermal oil heater is used for heating the cargo. 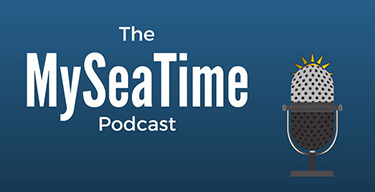 Steam heating is the most common heating system on board chemical tankers. In that case, charterer will provide a portable thermal heater to heat the cargo, if required. This heater’s pump is run by the ship’s hydraulic power pack. So connections from the main and return hydraulic line will be given to the portable heater pump. Ship’s steam will heat the thermal oil. So connection from main and return line of ship’s steam system will be connected to portable heater. Finally, the thermal oil outlet from the thermal heater will be connected to tanks steam inlet line. From return line of the tank, a hose will be connected to the thermal heater inlet into the thermal oil tank. The idea is to heat the thermal oil with ship’s steam and send this heated thermal oil into the cargo tank’s heating coil. Before we connect the thermal oil heater with the tank coils, we need to blow the coils with nitrogen. This is to remove any traces of water as well as to remove moisture from the heating coils. 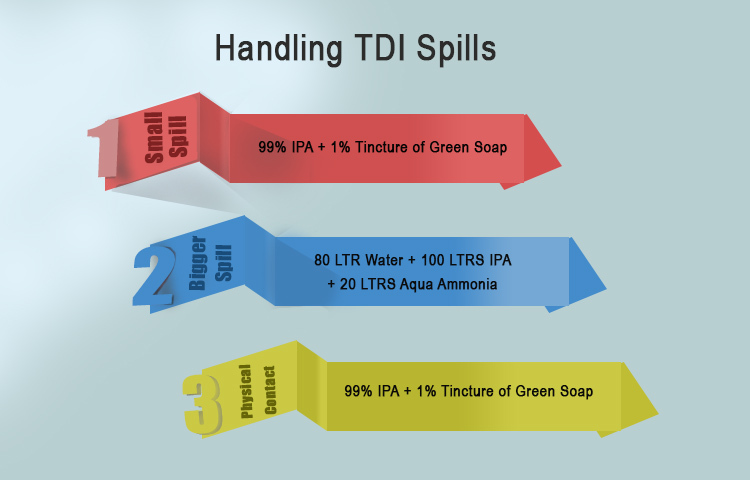 Handling TDI spill require certain chemicals. We need to make sure that we have these chemicals ready before we start loading. Before arrival loading port, make sure you have ordered all the materials required to handle TDI in unfortunate event of any spill. Before loading starts, we need to have these chemicals mixed and kept standby. Well this is routine for all the cargoes but it is even more important with TDI. The pump cofferdam should not be leaking. 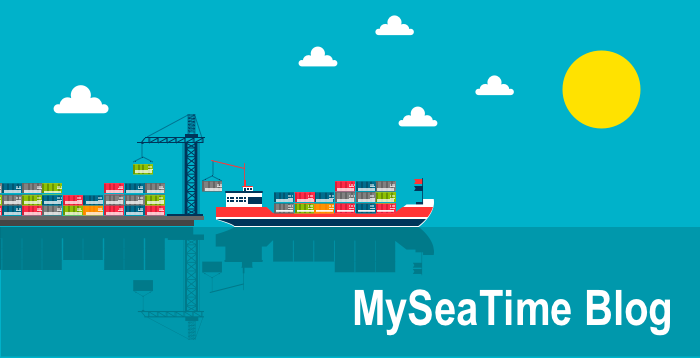 If it is leaking then we must renew the cargo seal (or Hydraulic seal) whichever is leaking. With TDI inside the tank, we would not even allow the air (and moisture) to be inside the pump cofferdam. Yes, we need to be that particular about this cargo. We need to first blow the cofferdam with nitrogen and then fill the cofferdam with a chemical called DOP. To fill the cofferdam, we need to remove the air inlet and outlet pipes to the cofferdam located on the pump stack. We can then fill the DOP with funnel. 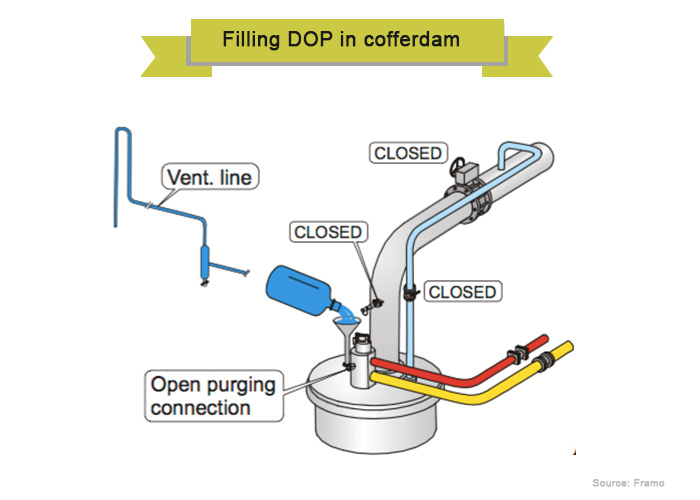 Continue filling DOP until we get DOP from the outlet of purge pipe. Well actually speaking there is no antidote for TDI exposure. Only the effects of exposure to TDI can be treated by the available antidote. Before we can start loading, we must have this antidote for TDI available on board. If not already available on board, We must request the antidote kit first thing after receiving the first voyage order. The antidote is only available in south Korea and few other countries. So it would take some time to arrive in US if you are loading TDI in US. As TDI reacts with moisture, the tank will be purged with dry nitrogen to bring the dew point of the tank below -40 C.
But to measure the dew point, vessel need to have a dew point meter on board. Charterer will provide this meter but we need to make sure that arrangements are in place. This is one action which will take out much of your troubles during carriage of TDI to discharge port. And I must say even if vapor tightness was done few months back, it will be worth to do it again for TDI tanks. You need to make sure that tanks can hold the pressure. If your tanks are absolutely vapor tight, you would hardly need any nitrogen to fill in the tank. But we need to be ready for any unforseen situations. Ideally 10 Nitrogen bottles for one tank are considered enough. But if your tanks are not vapor tight, any amount of nitrogen may not be enough. That is why I stress that vapor tightness of the tank is very important. Why TDI is dangerous ? What action to take if in physical contact with TDI. Hose connection/Disconnection will be done wearing full chemical suit. So the training also need to include wearing of chemical suit and SCBA. Particular emphasis to be made on the practice of shower under emergency shower Before removing chemical suit. This is to remove any traces of TDI from the suit and so to avoid exposure with TDI. Oh well, you are ready to arrive at load port. Usually TDI is loaded as a small parcel. Most of the times only in one or two tanks. It is advisable not to load TDI concurrent with any other operation including loading of other cargoes. Before the loading operation can start, as I said tanks need to be purged to dew point below -40 C . This is what we call drying of the tanks. Hose connection has to be done after donning full chemical suit and SCBA set. The loading rate need to be as less as possible. Usually TDI is loaded with loading rate of not more than 300 m3/Hr. Sampling need to be “closed sampling“. In spite of “closed sampling”, persons involved in sampling need to be in chemical suit and SCBA set. 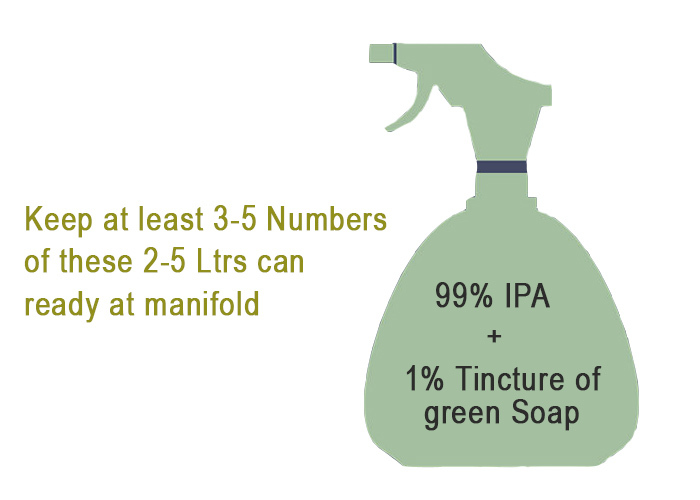 Because of high toxicity, Manifold samples are not allowed for TDI cargo. However this sometimes could be allowed on case to case basis. 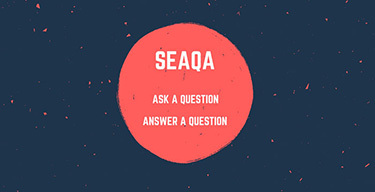 You must follow company manual about your company requirements for sampling of toxic cargoes. You can seek clarification from the company for if manifold samples need to be taken for TDI cargo. The only issue you need to be worried about during the voyage is the vapor tightness. Off course you also need to measure dew point daily. But if the tanks are vapor tight, you would not need to worry about any thing else. If you are sure of the vapor tightness of the tank, you can be sure there will not be much of trouble during your voyage. If your tanks are not able to maintain the nitrogen pressure on your voyage, there are few things you can do. And you would agree that there can be many sources. The pressure might be dropping from the butterworth hatches, tankdome packing or PV valves. It is possible that all these are contributing in a small extent to have a larger impact on pressure drop. Any way, you should never use the soap solution method to find the leak. If you think you have found some source of nitrogen leakage, you should try to correct it. For example if the leakage is from butterworth and tank dome, you may try to tighten the covers. if the leakage is from PV valves, there is hardly anything that can be done at this stage. Some companies fix rupture disks in PV valves of the TDI tank to avoid any leakage from PV valves. These rupture disks are designed to rupture at PV valve lifting pressure (mostly 20 KPa). The PV valves has a metal to metal sealing. Over the period, these metal surfaces develop pittings, which allows the leakage. 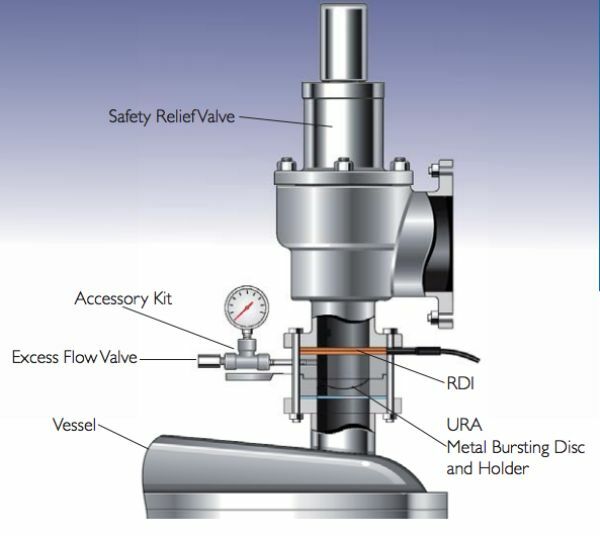 The rupture disks ensures better sealing and thus no leakage. These rupture disks are fitted temporarily for cargoes such as TDI. If fitted, the rupture disks need to be “approved one” and suitable with the PV valve fitted on board. Also it is important to have a tell Tale Gauge also fitted between rupture disk and PV valve. In any case, you need to have enough nitrogen bottles to top it up as the pressure goes down. Discharging will be with vapor return line. And as with all discharging operations with vapor return line, you need to ensure that tank pressure is not too high or too low. The stripping need to done with the nitrogen. i) Prewash is for MARPOL purpose and for prevention of pollutants into the sea. Cleaning of TDI tank with chemical is for better after cleaning of the tank as TDI is insoluble in water. ii) Prewash is usually done with water where as this cleaning is done with a chemical called PCE. TDI is soluble in this chemical and that is the reason of using this chemical. Around 5 m3 of PCE is put into the tank through the manifold. The chemical is then recirculated for atleast 30 minutes. If there are two TDI tanks, this solution can be transfered to the second tank. After recirculation, the chemical will be given back to the terminal. The process is repeated with fresh stock of 5m3 chemical. If you have fixed tank cleaning machines, the recirculation will be much easier. But if you need to lower portable machine, every effort should be made to avoid crew exposure with the TDI vapors. The tank cleaning after discharging TDI is then a routine chemical tanker operation. 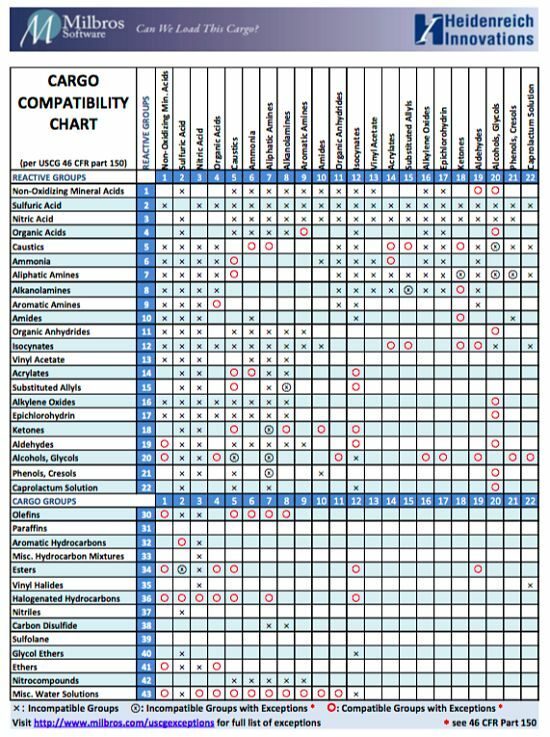 As you are aware that Miracle and Milbros are two very good softwares for tank cleaning guide. 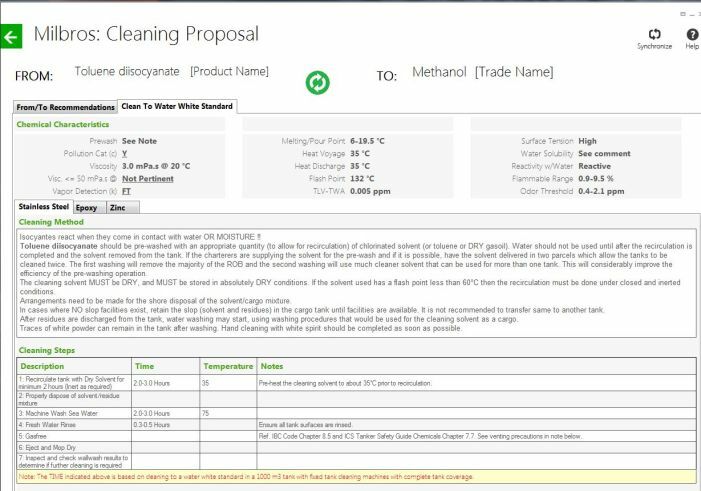 Click on From/To cleaning and search/choose the present cargo as Toluene diisocyanate. Choose the next cargo and click on View results. This will give the tank cleaning procedure for cleaning the tanks that contained TDI. The tank cleaning involves hot sea water wash for 2-3 Hours and then rinsing with fresh water. Finally after the TDI tanks are clean and you are ready to load next cargo, there are few thing that need to complete. Flush thermal oil from the heating coils of the tank. For this, we can remove the inlet hose from the steam coil and blow nitrogen or air into the coils. Connect a hose to the outlet and take out the thermal oil into empty drums. 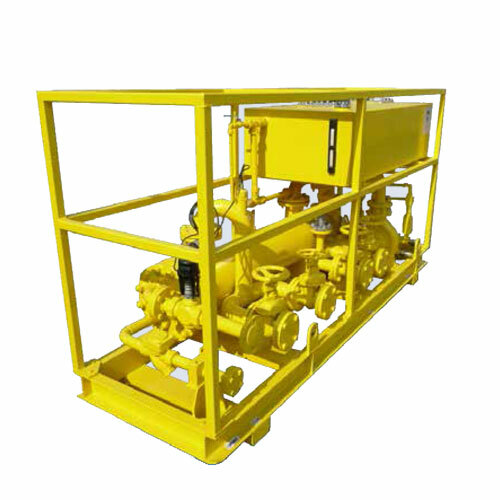 Disconnect the Hydraulic system from the portable thermal oil heater. Purge the cofferdam to remove the DOP from the cofferdam. Person purging the cofferdam must be wearing chemical suit during purging. TDI is one of the most dangerous cargo carried on chemical tanker. Any exposure to TDI can have immidiate or long term health complications. Apart from health complications, if TDI is not handled in the way it warrants, serious accidents can result. However if handled correctly and as per guidelines, TDI is just like any other chemical carried on chemical tankers. Nice article! Also to include that an exothermic reaction occurs when tdi reacts with neutralizer(ipa and nh3 mixture) resultant is a foam like substance. To avoid the additional cost of portable thermal oil heaters, a good operator will suggest u to load this cargo besides a heated cargo so that due to adjacent heat u can maintain its temperature! Good points. Thanks for contributing. As always, your articles are very concise and helpful. Can you please name the antidote for this cargo? Also in general where to find the antidotes for any specific cargo when we receive orders , for eg:- Para Xylene. Thanks for the write-up. It`s really a good read and also looks promising market. 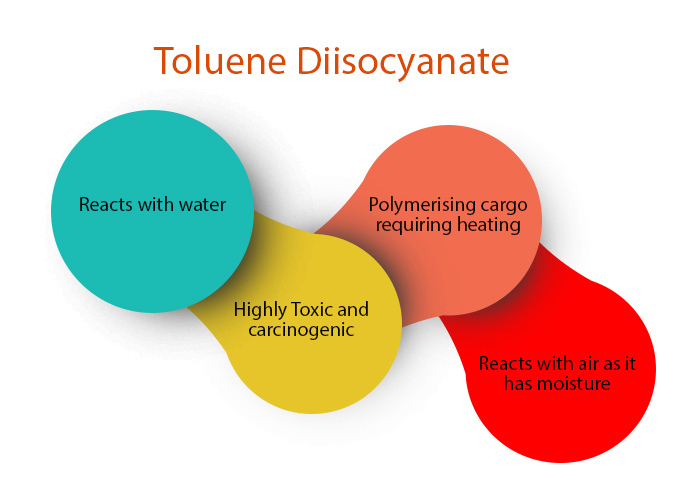 I went through a toluene diisocyanate market report at valuemarketresearch.com that evaluated the market across various segments. A deep dive into it might be profitable.